Callers want to talk to human beings. YesTrak provides the people and the technology to make it happen. 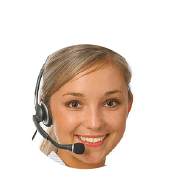 Live voices to make your callers comfortable. No one calls a phone number wanting to hear the voicemail message. Without a warm, friendly voice answering your calls to help your callers take action, you risk losing customers to your competitors. YesTrak ensures that your valuable efforts don’t go to waste. You spent a lot of time and money to get the phone to ring, now make sure your calls are always answered by live professional agents. So you can get back to your callers when it’s convenient for you. 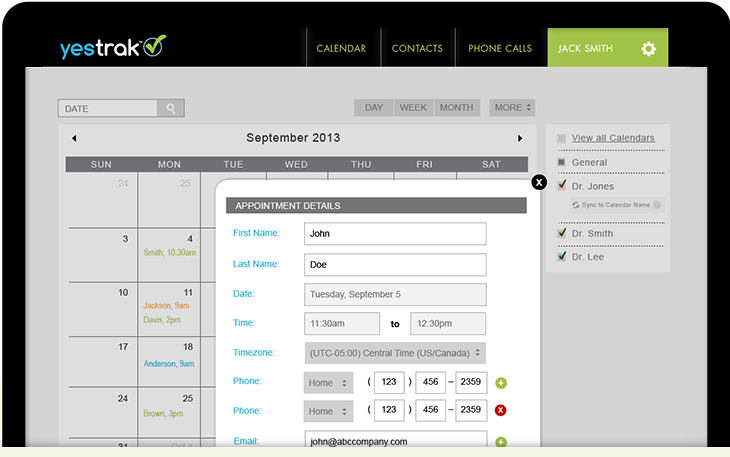 So that your callers are scheduled on your calendar and driving increased billings for your business. To pre-qualify your callers, gather their necessary information, collect an RSVP, and so much more. Our professionally written scripts make it easy for you to get started. There’s no need to wrack your brain trying to find the right words for us to say to your callers; we’ve done the hard work for you. 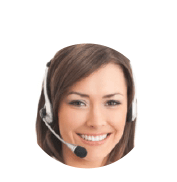 Simply choose the call center script that’s right for you (or use multiple scripts at the same time) and fill in the blanks with the exact verbiage you want said. You type it and we say it. It’s that simple! You control what we say. Your business is always changing — and so will the actions you want us to take with your callers. With customizable routing, real-time editable scripts, live calendar syncing, and more; we make it easy for you to adjust the way we handle your calls on the go. From your desktop, tablet, or mobile device — make changes within our system as often as you want. 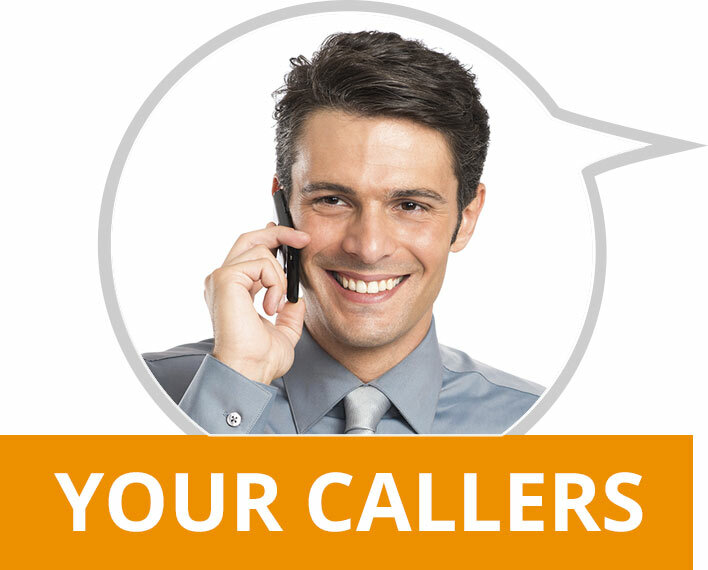 YesTrak makes sure your callers get the call center services they deserve. They don’t care if your staff is out to lunch, gone for the day, or just too busy to get to the phone… today’s customer is demanding. We know how busy you are…but your callers won’t. 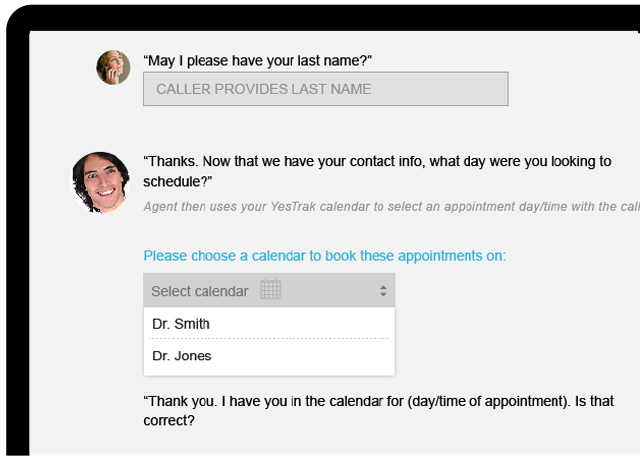 With the YesTrak advantage, our agents keep your callers engaged and comfortably in the hands of a live person. Rest easy knowing that your staff can get back to your callers at a time that makes sense, without a lost opportunity to secure revenue for the business. Business Owners need results. 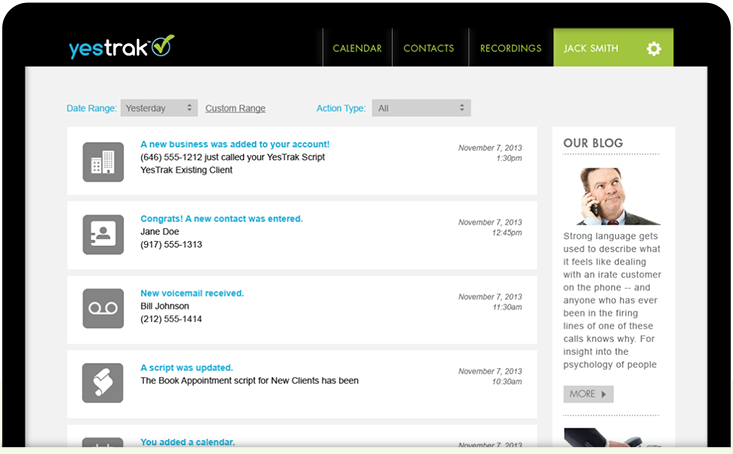 YesTrak shows you results in real-time. There’s no shortage of information to keep up with as a business owner. Customer satisfaction, monitoring your competitors, measuring your distribution channels, media, finance, strategy, operations, marketing, staff management…there aren’t enough hours in the day. To excel, you need business process tools that help you measure results, on the fly, that are easily deployed. If that tool lets you outsource time-consuming functions at a fraction of the cost of adding a new employee, the added-value becomes clear. For phone handling peace of mind, YesTrak is that tool. 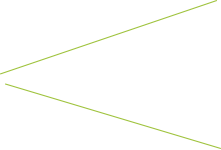 At our core, YesTrak is a call answering solution. You know that sending calls to voicemail costs you revenue and impedes customer satisfaction, so the benefits of a live agent to cover your phones when your front desk can’t is clear. YesTrak ensures you have a live voice to capitalize on revenue opportunities before and after work hours, as well as at lunch. 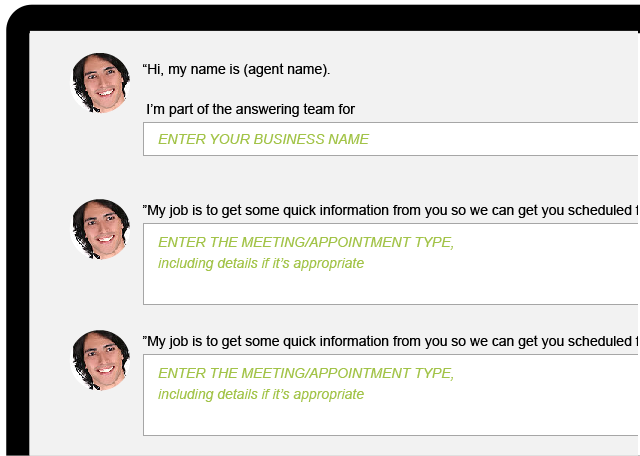 No more sending callers to voicemail messages when they’re actively seeking your services. Our professional call center agents book new appointments or pass on important messages, before callers hang up and go to your competition. The modern front desk is overwhelmed with in-person customer care, general tasks, some marketing responsibilities, a bit of accounting and whatever little twist your business puts on this catch-all group. The caller being kept on hold is the one who frequently suffers in this scenario — even though they’re the ones who make sure you can pay your bills. By allowing YesTrak to help with your phone answering, we free up your front desk to provide focused attention on whatever needs to be dealt with in the office that day. When callers pick up a phone, they expect a person to answer. 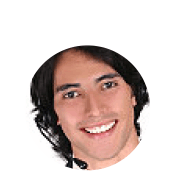 Our friendly voices keep your customers smiling – and showing up at your door. Our real-time notifications let you and your team assess the importance of each call received to either call the person back right away or wait to call them back after you have properly performed the research they are requesting. The ability to add additional phone handlers in minutes at a call center allows you the flexibility to test new product lines or marketing offers without having to take internal staff away from their daily responsibilities. Try a new marketing offer, and use our scripts to test interest and collect information before deciding to deploy more resources. We’ll even give you a phone number to use as part of our service. It’s a turnkey way to pursue new business opportunities. Is having staff members on vacation or out sick putting your operations in a bind? No longer. We can pinch hit whenever you need us to keep your office moving forward, not backward. Eliminate the stress you encounter when you are short-staffed. Partnering with YesTrak is like having an army of call center agents available at your disposal whenever you need them. Real-time notifications, delivered right to your computer or smartphone, means you never have to wonder what’s happening with your phone calls ever again. Get an email or text immediately, whenever we take a new call, with a full message included. You’ll reach new levels of understanding about your call flow and the overall success of your marketing programs without ever having to change a single system in your office. YesTrak gives you the Power of Voice. What you choose to do with it is only limited by your imagination. 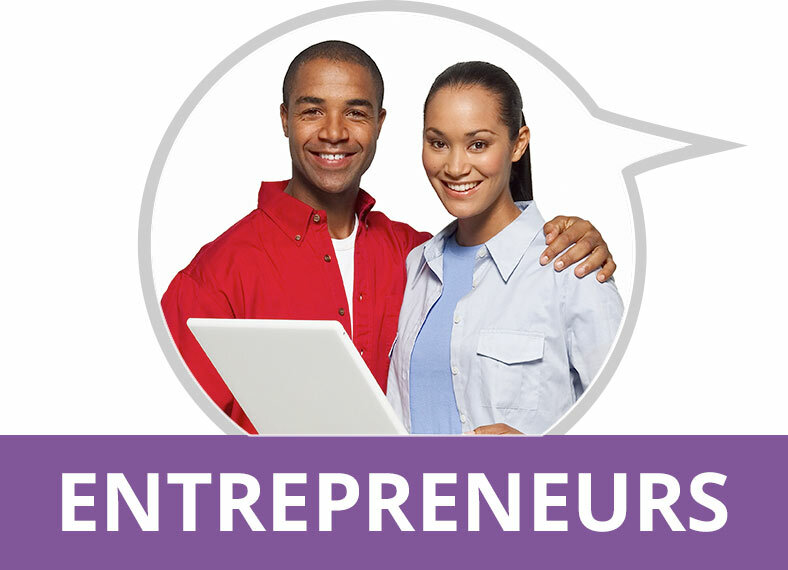 Entrepreneurs need big help at a low price. 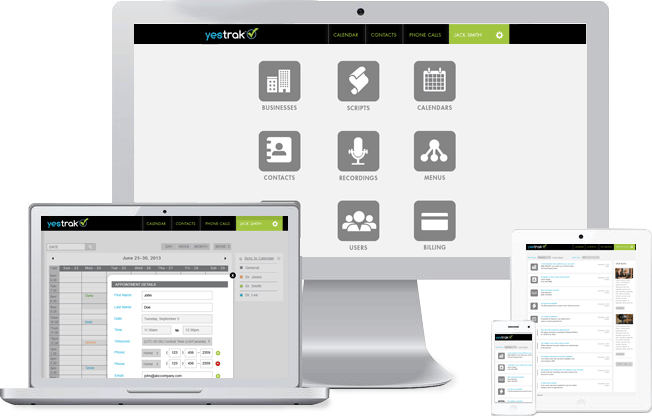 YesTrak gives you a front desk, sales team AND customer service department for the cost of lunch each day. Entrepreneurs. Sales representatives. Business executives. One-man shops. Whichever you are, you’re passionate about what you do, protective of the brand and image you’re trying to build, and conscious of the price you spend on tools to maximize your ability to grow quickly. You want to spend $1, get $5 back in value, and know that the money you spend will buy you more time to grow your business. Our call center solution allows you to forget about the phones and focus on your future. Easily customizable scripts, professional live agents, automated menus, real-time call routing – YesTrak is the complete phone handling solution. It’s so simple you can operate without even owning a phone! Let us answer your calls, capture leads and set appointments on your calendar. You get an e-mail or a text immediately after the call, with an at-a-glance summary of the conversation so you can capitalize immediately on any opportunities, or perform more research before responding to your callers at a time that is more convenient for you. You can even listen to the call recordings from your computer, tablet or mobile phone to gain more insight into your customer’s needs before responding. Our service is fantastic for businesses of all sizes, but for entrepreneurs, we think it’s essential. Office Managers demand efficiency. 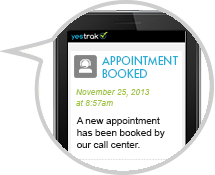 YesTrak ensures increased productivity for your front desk. ‘I don’t have enough to do’, said no office manager, ever. You’re busy. You need tools that make you more efficient with your time. Customer care, accounts payables, accounts receivables, marketing, HR, birthday cakes…you and your staff (should you be so lucky) juggle everything, every day. Your desk is on the front lines, and sometimes that ringing phone becomes a casualty of war when you have an irritated customer, confused colleague and a food delivery guy standing in front of you at the same time. You need to know that a missed phone call won’t mean an angry boss who doesn’t realize how many things you’re managing at once. YesTrak is a lifeboat in this sea of chaos. Instead of having to listen and take notes on a bunch of voicemails in the morning or after lunch, send your calls to us. We’ll send you immediate notifications, via email or text, with at-a-glance summaries of the message we take or appointment we set. In five seconds of reading, you’ll get to the heart of what used to take you five minutes on a phone call (in the midst of whatever emergency you were dealing with in the first place). On the fly, you can decide if you need to call that person back right away, or if it can wait ’til a better time. If it’s a message for someone else, just forward the message on, no writing on your part, in no time at all. There’s even an option to record your calls so you can listen to them in the system if you need deeper insight into specific calls. These recordings allow for complete transparency and accountability. We recognize we are an extension of your team, and that’s why we want you to know everything we are doing on your behalf, and without much effort to get it. That makes us very unique in the call center world. In short, YesTrak makes it easy for you to own the phone and look like a communication rock star. To learn what else we can do to put time back in your pocket, click below for a free demo and consultation.